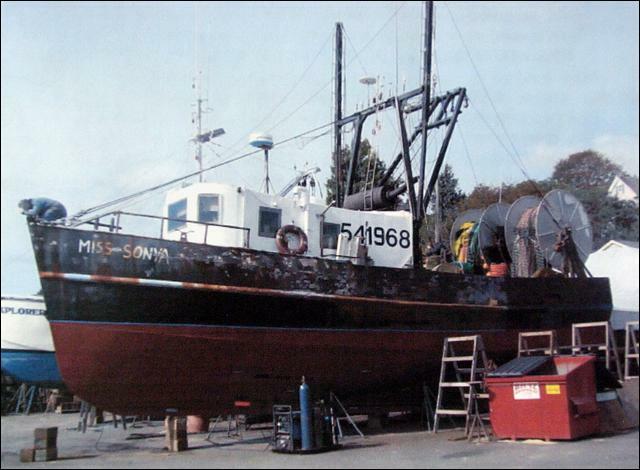 The Miss Sonya was a Gloucester-based fishing vessel that fished primarily for cod and yellow tail flounder. The Miss Sonya was built in 1972 by Olin E. Bass and had previously been named “Lizzy Bear.” The vessel sank after it began taking on water a few miles from Gloucester while returning from a week-long voyage that had led the crew out to Stellwagen Bank. According to various news reports, the Miss Sonya was exposed to greater risk by having to stay at sea longer than necessary because their catch had amounted to the equivalent of two days of fishing, when in actuality they had caught it in one day. Fishing in Stellwagen is counted as 2 days against the boat’s permit, even if the boat only fishes for one day. The Miss Sonya had caught the equivalent of a two day quota of fish and therefore had to stay at sea an extra day – a day that brought them much closer to bad weather. On the day of the sinking, the winds were Northerly around 20-25 knots and the seas were about 4-6 feet. With a sea like this on the boat’s stern or aft quarter, swamping is a much bigger concern — as the old saying goes, “beware the following sea.” The Miss Sonya was struck by waves, rolled to starboard and quickly capsized. The captain of the Miss Sonya sent a distress call to the U.S. Coast Guard at 7:28 am, and the Coast Guard was able to reach the boat, rescuing the captain and 1 crewmember within 22 minutes, averting a tragedy. The Miss Sonya rests in 160 feet of water approximately 3.5 miles off Gloucester. In April 2008, NADE conducted a survey of the Miss Sonya for the insurance company handling the loss of the vessel for the purpose of observing and documenting the condition of the hull, as well as looking for potential environmental impact (fuel/oil leaks). The wreck sits on a very soft, clay-like mud bottom. On our initial dives, visibility was very poor – pitch black and ranging from about 1-5 feet on average, which was somewhat due to the tide and overall ocean conditions at the time of our visit (overall conditions were very poor in general). This wreck is likely to have lower visibility given the bottom composition and size of the vessel, which makes stirring things up easy with a group of divers concentrated in a small area. Despite having turtled while sinking, the Miss Sonya is upright, semi-intact and is listing sharply (approximately 35 degrees) to starboard on the bottom. Like most “new” shipwrecks, there is quite a lot of debris floating around the wreck, suspending in the water column – fishing nets and rope being the most prevalent. Part of the A-frame has also come down and the starboard spreader arm is laying out into the mud. Beware of cables in this area, as they are hard to see in dark water.